I have an ASP.NET MVC application that I would like to have both public and private features. Typically this is done by implementing an authentication / authorization gateway to gain access to the private features. Previously I blogged on an implementation using the ASP.NET membership / role providers with an XML-based membership. This blog post will detail how to use OpenID and OAuth to provide an authentication layer. Authentication – You are who you say you are. The application knows your identity. Authorization – Based upon your identity (via Authentication), the application provides access to features. Public access is provided to base features. Private access to enhanced features. Here is a screencast showing the implementation in action. The web application starts by presenting an area that allows the user to select between various OpenID / OAuth providers. The following screenshot shows this area. 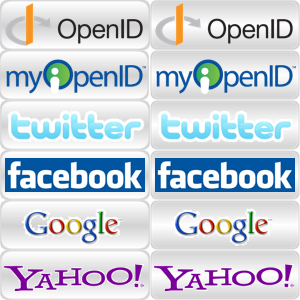 This provides a mechanism for the user to select one of the OpenId (OpenID, myOpenID, Google, Yahoo) or OAuth (Twitter) providers. Clicking on one of the providers starts the authentication process. Both OpenID and OAuth use a series of redirects to get the user authenticated. The key is that the authentication occurs on the provider’s site and that’s where the passwords are stored. Clicking one of the above providers results in a post to our application’s server. Our server then redirects to the provider’s server (after possible adding information to the post data). Here is a screenshot of the Twitter authentication page after the redirect to the Twitter provider. Clicking the “Allow” button causes post to the Twitter servers and another redirect. This time back to our application’s server. This redirect includes information about you that is supplied by the OpenID / OAuth providers. At minimum the redirect supplies a ‘username’ back to the application. Our application can then look up the ‘username’ in the database to determine if the user is allowed access. Users that are allowed access will have the above login area swapped out for a panel that provides access to features only available to authenticated users. The following screenshot is an example. Now that we have covered the workflow, let’s take a look at some code. Since we have just looked at the presentation layer, let’s start with the ASP.NET MVC views. The logic to display either the login screen or the panel with features for authenticated users is in the Master Page. The following code simply looks to determine if the user is authenticated. If not, it inserts the login partial view. Otherwise, it inserts in the panel partial view. The panel partial view is provided by the following markup. The above code inserts a ‘div’ containing two ‘spans’. The first ‘span’ is ‘floated left’ (via the CSS class left) and contains the user’s full name. The full name is stored in the ‘Session’ dictionary by the Controller (more later). The second ‘span’ is ‘floated right’ (via the CSS class right) and contains an unordered list of links that provide access to features available to authenticated users only. Be sure to mark these action methods with the ‘Authorize’ attribute otherwise users could directly navigate to the URL and access the feature. The following CSS styles the panel partial view. The login partial view markup is shown below. The outer ‘div’ wraps a ‘form’ area that contains two child ‘div’ elements. The first child ‘div’ contains an unordered list of providers. This will be styled up using CSS and an image sprite to render the button images. The second child ‘div’ provides an ‘input’ text element that allows the user to enter the URL to any OpenID provider. The following CSS styles this partial view. Towards the bottom the background image sprite for the provider buttons is set and individual offsets / hover effects are configured. Here is the image sprite that I am using. The left column is the normal button faces and the right column provides a subtly different (maybe too subtle) hover image. Before discussing the action methods of the controller, you will need to get the DotNetOpenAuth library. Once you download it add a reference to it from your web application project. If you want to get twitter connected up be sure to also download the ‘TwitterConsumer’ and ‘InMemoryTokenManager’ implementations. These implementations are C# code files that you will need to add to your project as well. I have named the controller ‘AccountController’ and the following code shows the constructor and private fields. The application uses Ninject as a dependency injection container (thus the missing parameterless controller constructor). Ninject will provide implementations of all the constructor parameters. References to these parameters are then tucked away into the ‘readonly’ fields. The ‘OpenIdRelyingParty’ instance is an object implemented by the DotNetOpenAuth library that is used for the OpenID authentication. The ‘InMemoryTokenManager’ is used for OAuth authentication with Twitter. Before you can use Twitter as an OAuth provider, you must register your app with Twitter. As a result of this registration Twitter will issue a ‘consumerKey’ and a ‘consumerSecret’ to substitute as the ‘InMemoryTokenManager’ parameters. This action method is called twice. The first time by our form being submitted by the user. The second time is a call back (redirect) from the OpenID provider. The first two lines of the method determine which stage we are in. The code inside the ‘if’ statement is executed when the user submits the form. This code creates an OpenID request and redirects to the OpenID provider. Notice that we are requesting first and last names along with an email address. 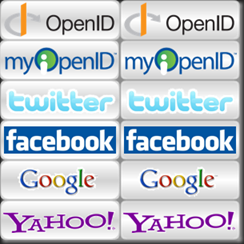 If the user has configured their OpenID provider to share this info it will be available to us. The OpenID provider then redirects their response back to our action method. This time, there will be a value for the ‘response’ The code inside the ‘switch’ statement processes that response. If the user is authenticated, the username, first & last name and email are send to the following ‘CreateUser’ action method. This code checks to see if this user exists in the local database. If the user is not found, the ‘Create’ view is sent to the browser. This gives our application an opportunity to collect and validate the first & last name and email values. I will not show that view because it becomes application specific as to what additional information you collect from each user. I will also not show the action method that the ‘Create’ view posts back to. If after the OpenID authentication the user was found in the database, the ‘username’ and ‘fullname’ are stored in the ‘Session’ cache, the user is signed in (cookie set) and a final redirect back to the ‘Index’ action method of the ‘Home’ page. This results in showing the panel that provides access to features only available to authenticated users. The OAuth action methods are shown below. The ‘OAuth’ action method is called when the user submits the form. This uses the DotNetOpenAuth library to redirect (on the Channel.Send method) to the OAuth provider. Notice this code explicitly configures the callback URL. The OAuth provider then redirects to the specified callback URL (‘OAuthCallback’ in this case) where the response is processed. A similar process is followed as in the OpenID case. Authenticated responses use the ‘CreateUser’ action method (same as for OpenID and shown above). Integrating OpenID and OAuth into your application is made very easy by using the DotNetOpenAuth library. There are a number of services popping up that provide a clean implementation of OpenID / OAuth authentication that you can pay to include in your project. The advantage is that they will maintain the compatibility with OpenID / OAuth as it evolves and are able to provide you statistics on access to your site. Otherwise, using the DotNetOpenAuth library and wiring things up your self is not that bad. If you find the DotNetOpenAuth library beneficial and if you feel so inclined to give back, they provide a way to donate on their page. should you post the complete code ? Great work! just one question if you don’t mind. How do you generate "TwitterConsumer.ServiceDescription" ? Don’t worry about my previous question. I found the answer. Great post, but isn’t it possible that two or more users might have the same username? I think you should be using the OpenID ClaimedIdentifier to uniquely identify users. Good catch. I have updated the blog to use the ‘ClaimedIdentifier’ property. On the same note, if I was supporting multiple OAuth providers (currently Twitter is the only one) I would have a potential username conflict. What about facebook? Can you take the same approach? Thanks, I am writing small website and this post was really helpful for me! Very nice post Bob. So far the best resource I’ve found on wiring dotnetopenauth into MVC. Big thanks. Could you either post full sample code OR have working samples within the library please. Gareth, I have been meaning to do so for quite some time. I finally have published the project that contains this code to codeplex. Check it out here: http://gpsnerd.codeplex.com. Please let me know if you have any questions. I am trying to integrate DotNetOpenAuth into my project. Trying to get authentication work first and then move on to implement a authorization provider. MVC is great, I just start learning it. But do you have any idea how this work using webform? I think the “control” should be pretty much alike. Anyway, thanks again. this post is greate, been looking for a dotnet samples for this logins. I have spent a week on dotnetopenauth now. I have some progress on the consumer side but the service provider side, I just don’t have any clue how DNOA is going to help me. Could you kindly give me some pointers on how to implement service provider with DNOA? Write three .ashx to handle “Request token”, “Access token”, “Authorize”, is that it? I want to show my thanks to this writer for rescuing me from this dilemma. Just after researching through the the web and getting notions which are not helpful, I figured my life was well over. Being alive minus the answers to the issues you’ve fixed by means of your good report is a serious case, and ones that might have adversely affected my career if I hadn’t come across your web page. The talents and kindness in maneuvering a lot of stuff was very helpful. I am not sure what I would have done if I had not discovered such a step like this. I can also now look ahead to my future. Thank you so much for your high quality and results-oriented guide. I will not be reluctant to suggest your web site to anybody who wants and needs guidance on this issue. i’m looking for server to server authentication how can i do that ? I have been trying to follow this… now I got it working for twitter and it gives me the username and user_id. But I want more details than that… and I have been trying to implement the openid stuff but I don’t know the open id url for twitter or even if it has one. How would I go about requesting extra information for twitter? I found my own way.. Anyone interested? Please let me know. If you managed to get it working for Facebook I’m interested! certainly loved surfing around your blog posts. hope you write once more soon! Nice article. I have integrated oauth for twitter. All is working well. But when I call “twitter.Channel.Send(twitter.PrepareRequestUserAuthorization(callBackUrl, null, null));” and it redirects to twitter website and there is displayed a message “Oh dear, something has gone awry. Invalid user name or password.”. I noticed that url is “https://api.twitter.com/oauth/authorize”. It must contains the token like “https://api.twitter.com/oauth/authorize?teknstringxxxxx”. Am I missing some thing in InMemoryTokenManager.cs(I copied it from the samples of dotnetopenauth). However, when I signin then I am redirected and screen_name is fetched. It’s truly a great and useful piece of info. I am happy that you just shared this useful information with us. Please stay us up to date like this. Thank you for sharing. no back up. Do you have any solutions to prevent hackers? shout out from Dallas Tx! Just wanted to mention keep up the great work! Good web site! I truly love how it is easy on my eyes and the data are well written. I am wondering how I could be notified when a new post has been made. You can certainly see your skills in the article yoou write. noot afraid too say how they believe. All the time go after your heart. this publish used to be good. I ddo not realize who you might be howeveer certainly you are going to a famous blogger when you aree not already. I get several e-mails with the same comment. Is there any way you can remove people from that service? great author. I will be sure to bookmark your blog and will often come back someday. I want to encourage that you continue your great work, have a nice day! Keep up the great work! You recognize, a lot of persons are searching round for this information, you can aid them greatly. interest. I will bookmark your blog and keep checking for new information about once per week. kane rendesi me per ju. Yes! Finally someone writes about rag เถื่อน. Undeniably believe that that you stated. Your favourite justification appeared to be at the net the simplest factor to take into accout of. I say to you, I definitely get irked whilst other folks consider issues that they plainly don’t recognize about. lot about this, such as you wrote thee book inn it or something. I feel that you can do with a few p.c. to power the message home a little bit, however other than that, this is wonderful blog. to lookie-lous who will be just cruising the internet. Hello! I know this iss kinda off topic nevertheless I’d figured I’d ask. a lot of the same topics as yopurs and I think we could greatly benefit from each other. If you happen to bbe interested feel free to send me an e-mail. Ilook forward to earing from you! Awesome blog by the way! Fantastic web site. Plenty of helpful information here. visit this website on regular basis to take updated from hottest news update. and place three medium size garlic cloves on top of them. When we humans put things into perspective we will soon realize that science is no different from metaphysics and spirituality. this website, since I experienced to reload the web site many times previous to I could get it to load properly. dailly and get good information from here every day. Good day very cool website!! Man .. Excellent ..